The organ was bought for the Music Room at Erddig in 1865, for Philip Yorke II, then aged 15. It was made by Henry Bevington & Sons of 48 Greek Street Soho, and cost £227.2s.4d. The date 1864 and the job number 654 is written on the pallets. Bevingtons were known for making small model organs. They were conservative in their voicing style, though the stop list, mechanism and appearance were up-to-date. 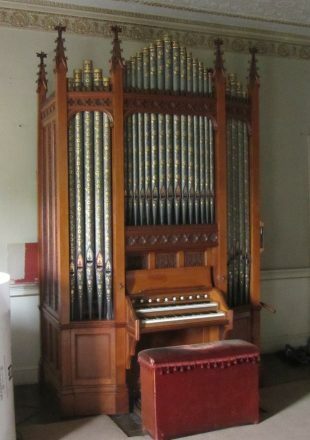 The organ is unaltered and still operates with hand- or foot- pumping only. In 1973 the Yorkes gave the house to the National Trust, who restored it and opened it to the public in 1977. The organ was restored by G&G in 2015. It is designed like a miniature church organ. There are five stops on the Great, Open Diapason (including front pipes), Stopt Diapason, Dulciana, Principal, Fifteenth and one octave of Bourdons. 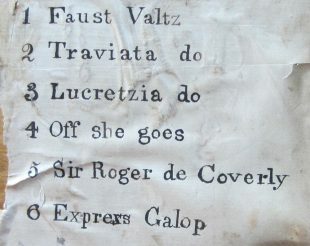 There are three stops on the Swell, Stopt Diapason, Gamba and Flute, with the Great Stopt Diapason on the bottom octave. The manual compass is C – f³ 54 notes, with the Swell C – B permanently coupled to the Great. The Great C-B plays the Open Diapason on its own, but using the same pipes as the Stopt Diapason, available only through the Swell. The pedal compass is C – gº 20 notes, connected to the Great keys. There is a Swell coupler. The pitch is 435Hz and the tuning Equal Temperament. Bevingtons also supplied a dumb organist.